What Does Florida's Minimum Wage Buy You? The minimum wage in Florida doesn't get you far according to a study out from the National Center for Children in Poverty. 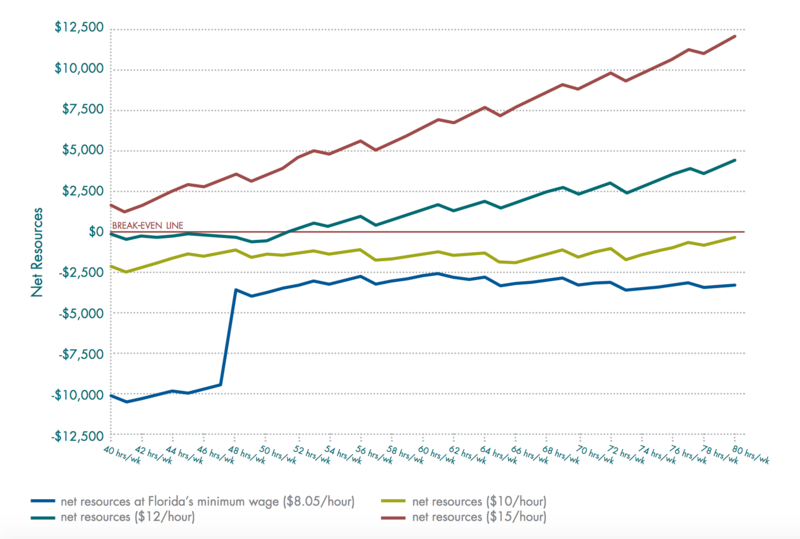 How much can Florida’s minimum wage actually buy? Well, not a whole lot, apparently. And making that wage will not carry a person out of poverty, according to new study from the National Center for Children in Poverty at Columbia University. The study modeled what families have to pay for when parents work—child care, transportation, taxes—and compared those expenses to increases in earnings as parents work more hours. According to the study, with Florida’s current minimum wage at $8.05 an hour, pretty much no matter how many hours people work they’re still not making enough break even. Annual net resources by hours worked per week, two-parent family based on a family living in Jacksonville, Florida, with one child age 3 and receiving SNAP, Medicaid/CHIP and federal tax credits, when eligible. Another big issue is the state’s decision not to expand Medicaid, one of 19 states to make that choice. As a result, most full-time workers who make minimum wage earn too much money to qualify for Medicaid, but too little to get subsidies through the Affordable Care Act. Insurance costs for these people in the “Medicaid Gap” are often very burdensome, if not prohibitive. With higher wages, however, workers qualify for subsidies after working fewer hours and get the benefit of these federal subsidies. Subsidies from the ACA account for the spike in net resources for a person making $8.05 per hour in the above graph. There have been several attempts over the past few years to increase the state’s minimum wage, but none have really gained any traction. Opponents to any increase argue that a higher minimum wage would mean job losses and increased burdens on small businesses. Hartig’s study finds it would require an $11.68 hourly wage for a two-parent, two-child household to escape poverty. You can play around with the study's tool and change variables like family size and location to see what kind of net resources you would end up with. A new study from the University of Toronto's Martin Prosperity Institute ranks South Florida in the top 10 percent most segregated metro areas in the United States. “Segregated Cities” ranks the degree to which 359 metro areas nationwide are segregated by income, education achievement, type of occupation and overall segregation. South Florida is 39th in the study's overall evaluation. Labor Day was created to celebrate the country’s labor movement and its social and economic achievements, but a new study from FIU’s Research Institute on Social and Economic Policy (RISEP) may dampen some of this year’s celebration. According to the federal government, "enough" is a simple, five-figure amount: $23,850. That's the poverty line. It marks a distinction between who is poor and who is not, who doesn’t have enough money to make ends meet and who does. But over the past month, I've asked you to tell me what you think it really takes to live in South Florida. Your answers averaged about $47,600 a year -- almost exactly twice the federal poverty level. 10/22/13 - Tuesday's Topical Currents is with Georgetown University law professor and author Peter Edelman. He’s written SO RICH, SO POOR: Why It’s So Hard to End Poverty in America. The US has the highest child poverty rate in the industrialized world. Income disparity is at its highest point since the great depression. One-half the jobs in the nation pay less than $35,000 per year. Learn more at 1pm on WLRN.